Former IGN Comics Editor Joey Esposito has a new comic about New York City, Pawn Shops, and life. How did the Kickstarter project turn out? New York City is a very interesting town. Growing up, I, like most Americans, knew about NYC from what I saw on television, in movies, or in musicals. When I was finally able to visit the city for the first time in the summer of 2007, I was taken aback by how this place which seemed so mystical and unique on screen was really just a normal town....with a few exceptions, of course. It's hard to say this experience was culture shock, but it was definitely jarring to have to adjust from the NYC in my head to the one in front of my eyes. Comics have been set in NYC pretty much as long as comics have been around, and more than a few have given commentary on the city itself. 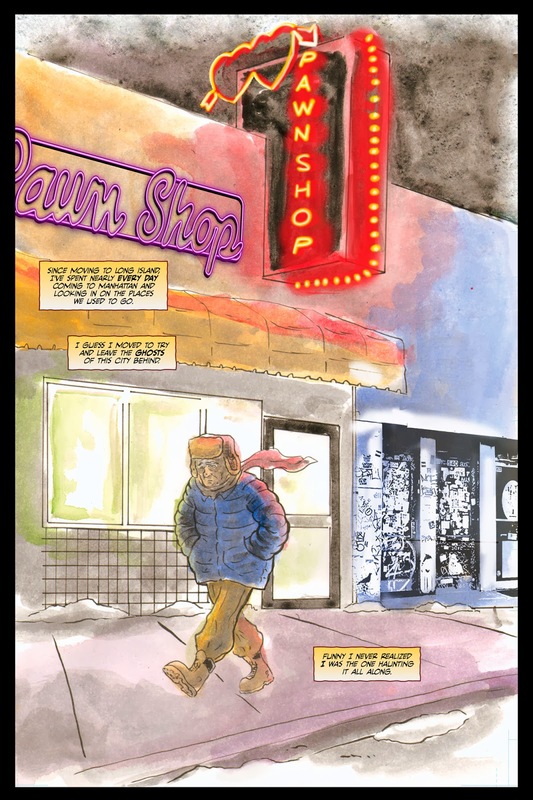 In Pawn Shop, a comic written by Joey Esposito and drawn by Sean Von Gorman, we get another New York story, but this one feels different. Funded largely by Kickstarter, the project is finally about to be released for the masses, and not a moment too soon. Much like that trip 7 years ago affected my views of the city, Pawn Shop does something very similar to the NYC I've come to know in various other comics. Pawn Shop, at its heart, is a story about life, and the way that our lives, while they may seem a singular experience, are often more interconnected and similar than we can even realize. 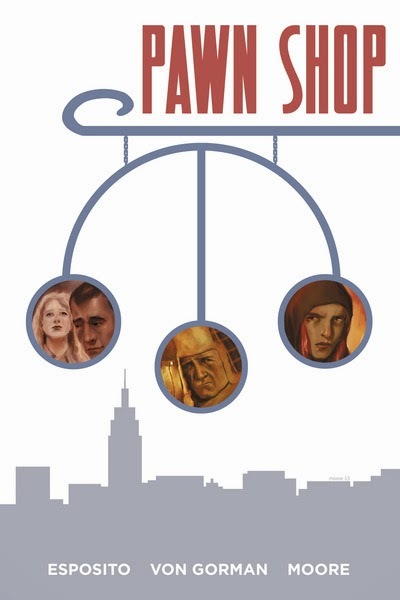 Told in a series of four chapters, each about a different character, Pawn Shop allows us to see what life is like for those who live in and around NYC, and the way their connections, whether superficial or something more, make them just as human as the baggage they carry. Our main characters are Harold, a widower looking for a lost item; Arthur, a nurse taking care of a bed-ridden patient; Jen, an alternative girl trying to find her way through life; and Samantha, an NYC city employee dealing with guilt and a feeling of hopelessness. Really, the loss of hope is a major theme running through the comic. Hopelessness may not seem like a very bright and cheery theme to read about in a comic book, and this book is often very sad, but it is that search for hope that also occurs in the story that makes the feelings of loss worth it. The inter-connectivity of these stories is a very nice touch, and one that helps to keep the chapters from feeling too disparate, but it is really the humanity of the characters that makes this such a strong read. Each of these characters has something about them that immediately creates a connection with the reader. Whether it is Esposito's strong, believable dialogue or Gorman's art that allows for this connection to be made is a close call, but both work in perfect harmony to make this happen. As mentioned, traveling to NYC for the first time can be a jarring experience, because, with all of the fiction surrounding the town, it is easy to forget that it is just a city populated with people...and each of those people has a story. Telling that story, or some part of it, seems to be Esposito's mission in writing this comic, and, on that level, it works brilliantly. Particularly the characters of Arthur, Samantha, and Harold are strongly developed. In the first chapter alone, I found myself experiencing the emotional roller coaster myself with Harold to the point of having to hold back tears of joy when the chapter reached its satisfying conclusion. Really the only weak link to the story was the character of Jen. Though Esposito certainly gives her the same amount of human qualities as his other characters, there is just something about Jen that does not feel as developed as the others. Her story may be the least connected to anyone else, which suits the character's personality well. While her story reaches a satisfying conclusion, it is the road of getting there that has its problems. Struggling with a jerk male friend and an addiction problem, Jen's story is one that we have seen over and over in various mediums. It is most definitely a story which many can sympathize with, but it would have been nice to see something as original with this character as we get with all the others. It can be said that I do not know as much about art as I do about writing, so critiquing the artwork of a comic can often be a difficult task. That being said, Sean Von Gorman's pencils in Pawn Shop are, at times, absolutely stunning. 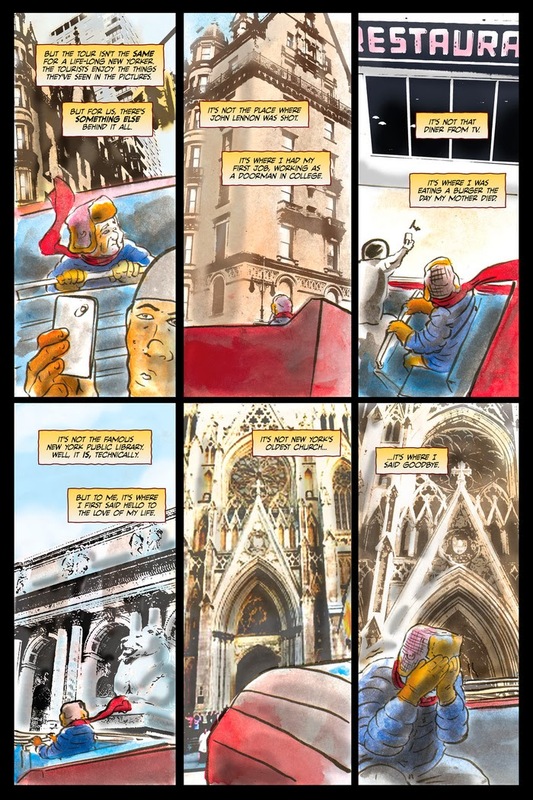 The book opens with a series of panels showcasing various New York locales, and it allows for a breathtaking look at the way Gorman's art flows. 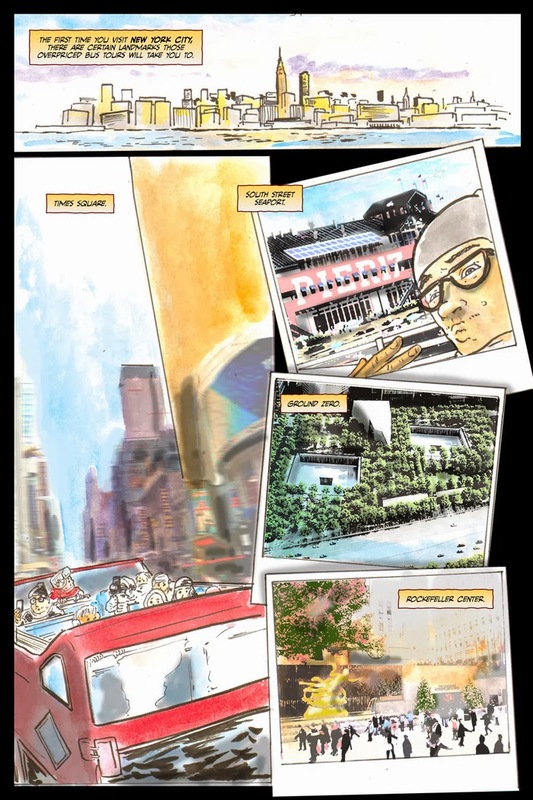 Photo-realism is mixed with more comic style artwork to create a beautiful image that completely encapsulates the city, the themes, and Esposito's words. Both men clearly have a great thing going when working on this project, and the two of them work in complete harmony. The character designs and facial expressions really help to establish the connection with the reader that is coming across in the script. A few panels every now and then feature some angles on the characters that make them look less than stellar, but the work should be judged as a whole rather than a few parts. With that in mind, Pawn Shop's art succeeds just as much as its writing. Gorman and Jonathan Moore's coloring in all four chapters should also be briefly mentioned as it is entirely the reason the art succeeds. 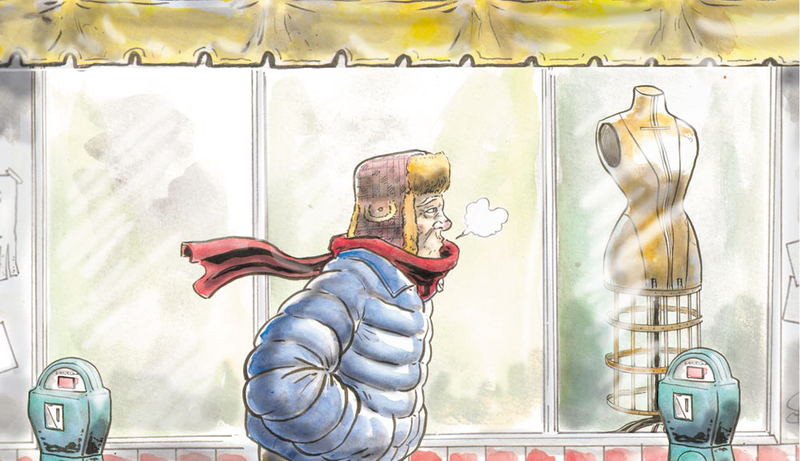 Bringing an obvious water color look to the entire thing adds an interesting level of depth to the book as a while. 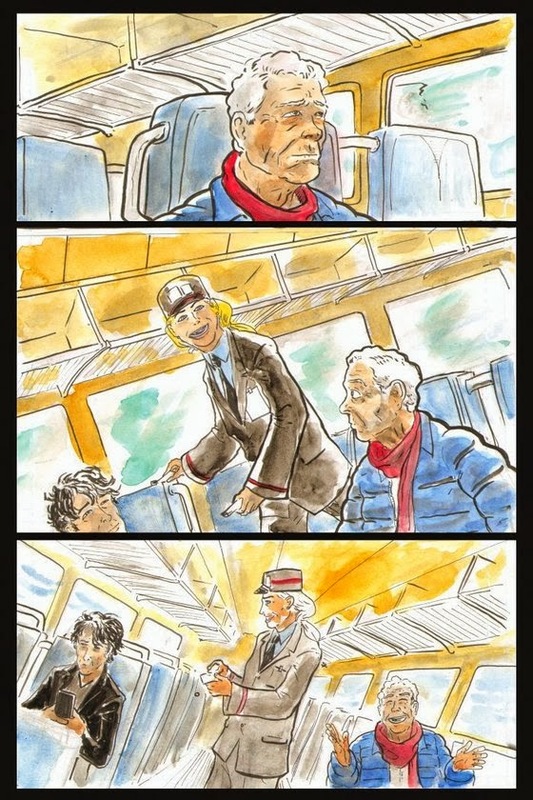 Water color is often seen as a very simple art style, but it is paired with so much depth and humanity in the story, that the simplicity really helps things out quite a bit. In this story we see a lot of characters who feel less than whole for one reason or another, and the water color helps to add to this. Not every part of the person is colored in on every panel, making it look as if a part of them is missing. This is not a mistake by any means, it is a wise choice in giving the thematic resonance of the story a place to be superficial. Reading Pawn Shop is a completely different experience from any other comic I have read. This is not necessarily because of the story, characters or art; there have been numerous other comics to reach me emotionally like this one. What happened with Pawn Shop, however, was that Esposito and Gorman added an extra layer to my reading experience in the form of music. In the opening pages of the trade, one can find a list of songs which have been organized into a playlist for each chapter. Each chapter gets five songs, and the artist selection ranges from anything from The Monkees to Bob Dylan to Tom Petty. Conveniently, the book also provides a link to a Spotify feed, where the music can be accessed easily. Not having a Spotify account, I created one because the temptation to listen to the music was just too strong. This just may be the first time music has been presented with art and story to create a comic book, and it works exceedingly well. It was utterly amazing to be listening to these songs as I read and see how not only the entire playlist perfectly encapsulated the chapter's main character, but each individual song perfectly captured what was happening on the page. The experience of reading Pawn Shop was able to draw out an emotional reaction that I never would have had if I had simply been reading the book on its own. It also allowed me to take my time with the comic, and appreciate every little detail in each panel. Not every comic should be paired with music, but more creators would be wise to follow Esposito and Gorman's lead. Going into Pawn Shop, I had certain views of New York City in the comics world. It is the place where Spider-man and the Avengers hang out, it is the location of Fabletown. Much like my trip to the real NYC, my trip to this New York completely changed my views on what this city means. The buildings are great for grandiose fights between superheroes and villains, but it is very easy to forget the (fictional) people that can populate the city. In their story, Joey Esposito and Sean Von Gorman combine art, words, and even music in a way which gives their reader an emotional look at humanity and the pursuit of hope and stability. It is not a comic without a few small problems, but, as a whole, it is a beautiful comic that will sit comfortably on your shelf next to Fables and Spider-man; not because of a thematic connection between the works, but because of the ways Pawn Shop can completely alter your views of New York City and the experience of reading comics. You can pre-order your own copy of the Pawn Shop trade paperback here. The comic will also be available digitally very soon.